1, Made the BF lunch ( fried chicken sandwiches adapting a recipe for fried pork which he said was delicious but wierd as he kept expecting to eat chicken. He thought it was very nice with chicken). For anyone into food; coat chicken in breadcrumbs and parmesan using an egg, mustard and orgegano bind and shallow fry – yummy. 2, Made the BF supper – roast beef and roast potatoes no less. The poor wee man is studying very hard for a new job at the moment and therefore requires his sustenance! 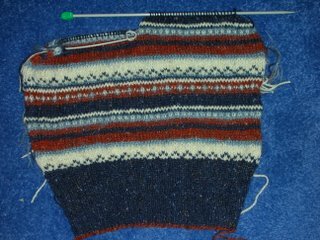 As you can see I have now got to the neck divide AND the armhole shaping – the FO banner is in sight but I think there are still a few miles to go – not least the ends that will need bending in (see previous posts on the subject) and working out how to do the sleeve/neckline ribs. I’m thinking of doing at least the arm ribs on DPNs in the round because that would just be like doing socks – I’de just have to make sure I got the round going the right way round! Also must acquire DPNs in correct size. However, on that note I do have the Olympia show rapidly approaching and I have high hopes that it will yield some nice new needles and possibly some yarn. I also have serious designs on one of those little sheep tape measures if I can track them down! Anyway, my telly schedule for today is not quite complete, having viewed Poirot, the Bahrain Grand Prix and another Poirot I now have Planet Earth – wow! So ttfn.